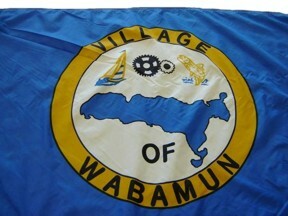 This is a close-up photo of the municipal flag of the Village of Wabamun, Alberta (population: 601). The Village is adjacent to the Trans Canada Yellowhead Highway 16 and is 60 km West of the City of Edmonton. Lake Wabamun is known for the recreational activities it provides like fishing for northern pike, yellow perch and lake whitefish; boating, water skiing, wind surfing and swimming. Boat launch facilities are provided and there are picnic, playground and swimming areas near the boat launch facilities. Major power plants in the area are represented by the gear wheels on the flag. The shoreline of Wabamun Lake is featured predominately on the flag. The village is near the site of a train derailment which resulted in major environmental damage when approximately 734,000 litres of heavy bunker oil spilled into Wabamun Lake on August 3, 2005.